I’ve been pouring over information on safety net programs, getting ready for Congressional testimony on Wed (more on that later). But in perusing this CRS document on the history of federal safety net—basically, poverty-reduction programs—I stumbled on a lot of food stamps for thought (I’ll look for a better link, but this may be a $ product). Let me be clear from the outset: I’m a firm believer that economies need safety nets. Or, backing up a step, I’m a firm believer that markets fail, and when they do so, the most economically vulnerable take the biggest whacks (actually, more of an “observer” than a believer here—this ain’t religion). And while I know there are now audiences in America who will literally applaud when someone suggests letting uninsured, sick people fend for themselves (watch it here), and members of Congress who inveigh against safety-net programs as the real source of everything that ails us, the fact is that most Americans agree with me on this one, which is one reason why we’ve always built such protections into the system. In my testimony—which I’ll post tomorrow—I go through the benefits of these programs not just in terms of poverty reduction, which is significant, but in terms of generational benefits—kids from poor families that receive some of these benefits have better education, employment, and earnings outcomes compared to similarly low-income kids who do not. But for now, I want to make two macro points. First, for all the popular wisdom that programs to help low-income people are swallowing the economy, the truth is that like so much else that plagues our fiscal future, it’s all about health care spending. The figure shows that as a share of GDP, prior to the Great Recession, non-health care spending was cruising along at around 1.5% for decades. It was Medicaid/CHIP (Medicaid expansion for kids) that did most of the growing. And looking forward—note the projection period—the growth in safety-net spending as a share of the economy is wholly a health care story. The Congressional Budget Office (CBO) forecasts that under current law, federal outlays for need-tested programs would continue to increase, even in inflation-adjusted terms, in the upcoming decade. However, that increase is attributable to health care programs. For programs other than health care, total inflation-adjusted spending is projected to decrease over the period FY2011 through FY2022. This is important, because it tells quite a different tale than an ever-increasing share of lazy-bones on the dole. Turns out here too we’re beset by the problem of health care spending that’s outpacing everything else. There ought to be a law…um…I mean, there ought to be a law that a non-politicized Supreme Court would uphold. Second macro point: improving the functioning of the safety net to incentivize and reward work is a perfectly legitimate goal, but it doesn’t happen by cutting, slashing, and burning. It’s easy to shove people into the low-wage labor market without a lifeline, and that might reduce your welfare, food stamp, or Medicaid rolls. But it will sharply increase your poverty rolls. Welfare reform in the 1990s is a good example. The very tight job market made a huge difference—evidence from the past few years shows that absent that, welfare reform functions poorly—but even with many more jobs available, it took a better safety net to help low-income families with kids actually get ahead. …aid to working poor families with children was increased during the 1990s. Earnings supplements for working parents through the EITC [a wage subidy for low-icnome workers] were substantially expanded through legislation in 1990, with a major increase in the credit amount enacted in 1993. A child tax credit of $500 per child was established by tax legislation in 1997. The 1996 welfare reform law also substantially expanded funding to help states pay for child care subsidies for working parents. So, you want my recipe for helping the least advantaged among us? Well, I’m going to give it to you anyway. Full employment, health reform that finds efficiencies where waste prevails today, and enough work supports to make work pay even in the lowest wage jobs. OK, back to my DC reality of fiscal cliffs, austerity, and nervousness re Thursday. Share the post "The Safety Net, Health Care, and Work Supports"
6 comments in reply to "The Safety Net, Health Care, and Work Supports"
I hope we can begin discussing this issue, because there is so much ignorance about it. Safety net programs — legitimate poverty relief — saved lives and enabled people to have the economic security vital to moving forward out of poverty. 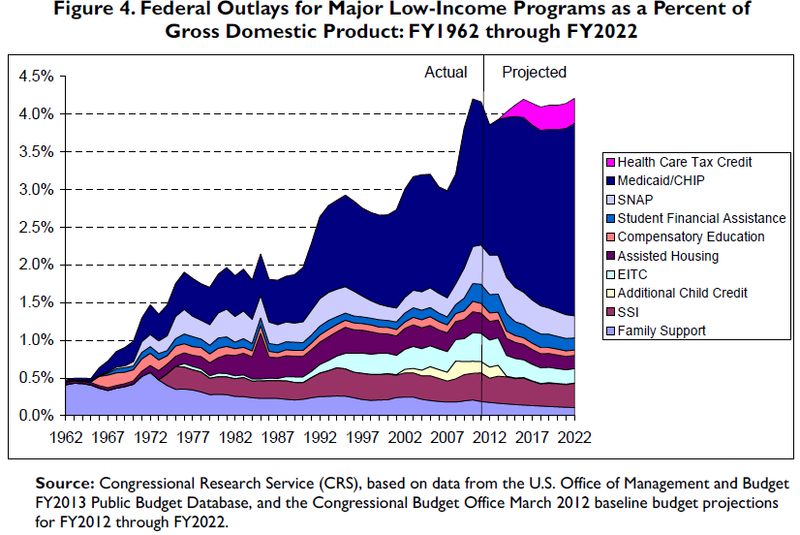 At its highest (1970s), AFDC (primary program) used a mere 6% of the fed. budget. Some 80% of AFDC recipients were able to quit welfare by the time their children started school. Through their own taxes, they then repaid the aid they had received over time. I would consider this a wild success! Welfare programs are the norm in the modern nations precisely because they serve the common good on so many levels, from saving lives to saving taxpayer costs for health care, prisons, etc. We need to overcome some 40 yrs of anti-poor propaganda, learning the role welfare played in America’s former success, and the role that ending it has had in our current economic deterioration. How is it SCOTUS is highly politicized again? because you disagree with their decisions? The issue at hand is the individual mandate. This has nothing to do with healthcare. It is about the last stop-gap between the concept of constitutional limits on government and government doing whatever the current majority wants to do to you. If govt can force you to buy healthcare just for breathing on U.S. soil what’s to stop them on future issues? The road to serfdom looms! Mike ….. Today people who do not have insurance and get sick/hurt go to the emergency room. If they have no assets they will still be taken care of. The cost of this is paid by all who have insurance or like Romney just pay cash. SOOOOOO How about this . Lets change the rule that you must have health insurance or cash before you receive medical care. Don’t have anything … fine. just stay home. There are millions of white americans that don’t have cash or insurance besides people of color. Now we have one more problem …. someone has to pick up all the dead, bury them, and general cleanup! Who pays for that? YOU? I should note that people assume that supports exist which don’t exist, and that existing programs do the job we would assume. Even Mitt Romney showed his ignorance about the “safety net,” assuming it meets the needs of the public. Most commonly, in exchange for food stamps, one will be required to provide proof that he applied for X number of jobs during the month. That’s it. No supports, no skills training. If you don’t have a telephone (many don’t), good luck getting a job. You might temporarily be provided with pt. time/min. wage work assignments, such as picking up litter.You might get a rent voucher, but good luck finding housing that accepts them. No cash assistance, so you might have to give up such luxuries as soap and transportation. We don’t have enough jobs for everyone, due to years of outsourcing. The jobs are gone. Period. And we no longer provide welfare aid. A point that many can’t seem to grasp: When you’re living on the streets, going to college for job skills training is not an option. When public need for any remaining scraps of aid is great, the odds of getting any help whatsoever shrink. I can’t stress this enough: There is no entitlement to poverty relief. People can and do die as a result of US poverty. We are no longer like the modern nations that regard poverty as an economic issue rather than a consequence of “bad behavior.” Please try to grasp the difference between being very poor and utterly destitute, since the number of destitute continues to grow. Our policies concerning our poor do directly violate that celebrated Universal Declaration of Human Rights, and this generation is OK with that. America wanted to “get tough on the poor,” and it’s time to let them know just how successful they are. That example was someone in a coma, and it does make sense to bill them for it instead of having the government pay for the uninsured. A better example would be someone who gets some other disease and doesn’t have insurance. And since it is hard to pay for health care without an income, you could say that not just isolated audiences, but 52% of the population is in favour of these people “fending for themselves”. This was most fun to read.